Always find yourself looking for another gear? 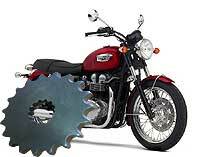 Simply add an extra tooth front sprocket for lower RPM and more relaxed cruising. These sprockets will fit all model years of Triumph Bonneville, T100, Thruxton, Scrambler, America and Speedmaster.